Dimensions 20" x 4.29" x 2.69"
Dimensions 10" x 4.29" x 2.69"
Baja Designs OnX6 LED light bars pack an impressive 6,450 lumens per 10” section. The OnX6™ LED light bars also integrate Baja Designs’ trademarked High Speed Spot™ reflectors to give you the guaranteed furthest projecting LED Light Bar on the planet. 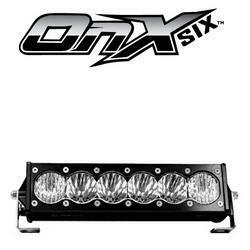 In addition, the OnX6™ LED light bar adopts industry standard sizing and is available in 10”, 20” 30” 40” and 50” sizes and compatible with most aftermarket mounting systems.